An extremely compact, underperforming PC at an absolutely punishing price. An attractive and compact prebuilt that neither performs up to its potential or justifies it's insane $5000 price tag. There's something compelling about a compact PC. In a world where PC cases on some of the best gaming PCs seem to be expanding daily, bloating up around ever larger GPUs and ever more elaborate cooling and lighting systems, the appeal of a tiny, portable rig is potent. 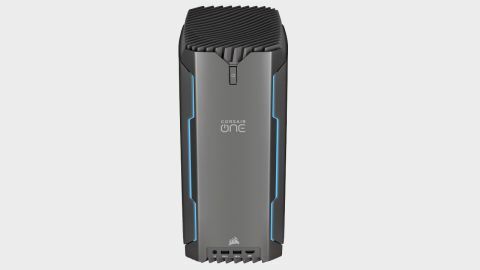 Pulling out the Corsair One Pro i180 from its little box (and the generous foam padding and massive Pelican crate shell it was shipped in) gave me a sort of electric thrill, a moment of wonder that such powerful components could be stuffed into such a miniscule chassis. It's a pretty chassis, too. Almost entirely aluminum in an attractive gunmetal grey, relieved by accents of RGB lighting in the form of bars running vertically up the faceplate, the i180 looks like the gorgeous robot offspring of the Marvel Cinematic Universe's Ultron. The side panels are checkered with tiny triangles that decrease in volume near the bottom of the case, which gives the impression of motion, the illusion that they're tumbling down from some bottomless font on the top. Even that top panel adds to the aesthetic, with its aggressive looking slats crossing above one of the main blowers, a work of industrial art, a tiny machine with teeth. That RGB tubing, fully customizable through Corsair's iCue software, isn't just for looks, either. It can actually indicate the system's temperatures, blinking an ominous red if it spikes in dangerous territory or remaining a solid, soothing blue when running closer to optimal levels. Unfortunately, the glamour began to fade when I started putting the i180 through its paces in our suite of performance tests. The major takeaway testing yielded was that, while a capable machine, the i180 underperformed compared to the RDY ELIBG205 which I recently reviewed, a prebuilt that shares the mighty RTX 2080 Ti that comes with the i180 but actually has a slightly inferior processor (a Core i9-9900K against the i180's Core i9-9920X) and costs almost half ($2,599) of the i180's $5000 price tag. Even in productivity tasks, like those measured by the PCMark10's Express benchmark, the i180 lags behind the RDY, managing only a score of 4,591 to the RDY's 5590. Of course, gaming performance is what I'm primarily interested in, and the i180 lags significantly behind its much more affordable competition. As you can see in the benchmark box, the i180 struggled to approach 60 FPS in most AAA titles at 4K Ultra, managing a meager 40 FPS average in Shadow of the Tomb Raider against the RDY's 57 FPS. In the ultra demanding, ray tracing enabled Metro Exodus, the i180 failed to achieve even a steady 30 FPS, cresting at an average 28.53. While these are certainly playable numbers, it's impossible to recommend a machine that can't match a competing build that costs $2,400 less. The differences are even more stark at 1440p, where the gulf between the RDY and the i180 is tens of FPS. Pricing is the i180's major Achilles heel. While some of the parts are proprietary and not available outside of Corsair's prebuilt, assembling a similarly specced machine on your own would cost you less than $4,000. While the i180 does have a few extras, like a 2 year hardware warranty, there's nothing here to justify a $1,000 markup. In fact, some of the proprietary parts like Corsair's custom case are actually somewhat of a hindrance. For instance, the odd design of the case makes it difficult to access some of the components and additional slots. An additional M.2 slot is buried behind the motherboard, meaning you have to remove the mobo entirely to get to it, a cumbersome process given the inclusion of several daughter boards. Even getting into the case takes some doing—you have to press a button on the back of the case with extreme force (I wasn't able to actuate it without jamming a screwdriver into it), which pops the top panel and exhaust fan off, and then unscrew four screws to open the side panels. Instead of being hinged at the bottom to easily swing open and remain in place, the side panels are tethered only by liquid cooling tubes you need to be careful not to pull on too stiffly when you're peeling open the case like a lobster's chitin. Inside, some of the sacrifices made to keep the i180 so tiny and kawaii are evident. It uses smaller laptop SODIMMs in place of standard desktop DIMMs to stash the RAM, and the case is incredibly dense and crowded with component. It makes swapping out parts or upgrading a difficult, finicky experience. It's also not exactly replete with USB ports (a pair in the front and five in the back), and oddly the only HDMI port is in the front rather than next to the DisplayPort ports on the GPU at the rear of the case. Beyond the initial appeal of that compact case and burnished gunmetal aesthetic, there's little to recommend the i180. Even if saving space is a priority, there are a number of other options that would cost you significantly less, some of which even manage their limited space in more intelligent or balanced ways. Without a significant reduction in price or a massive redesign, this a machine better left on the shelf.